From court-ordered reports, studies by the TNPCB, Central Pollution Control Board and NGOs, every assessment found evidence of water contamination. On 3 April, 2018, villagers in Kumareddiapuram thwarted attempts by Thoothukudi district officials to dismantle the public handpumps that were yielding yellow-coloured water reportedly contaminated by Sterlite’s copper smelter. The hamlet, which is located within the Therku Veerapandiapuram revenue village, less than 500 metres from the copper smelter complex, is one of several that has complained of groundwater contamination due to Sterlite’s operations. Complaints about groundwater contamination began within a year after Sterlite began production in Thoothukudi. Evidence of contamination also started emerging around the same time. However, while evidence has mounted, no remedial actions have been taken, forcing villagers in the vicinity of the factory to abandon groundwater and rely on expensive bottled water for drinking. Exposure to the contaminants in the groundwater continues as it is used for washing and bathing. Groundwater contamination is not easy to clean. In places like Bhopal, contamination arising out of Union Carbide’s operations prior to 1984 persist in the groundwater to this day, harming the health of those exposed to it. From court-ordered reports, studies by the Tamil Nadu Pollution Control Board, Central Pollution Control Board and NGOs, every study found evidence of water contamination. There is no dearth of evidence of the contamination of groundwater. There is only a dearth of action on the evidence. If there is no evidence in more recent years, that is because TNPCB – the only agency that does routine monitoring – does not publish or share the results voluntarily. ‘NEERI, 1998 Study: Within two years of commissioning the Sterlite plant’, the first court-ordered study to probe the complaints of pollution, was submitted to the Madras High Court. 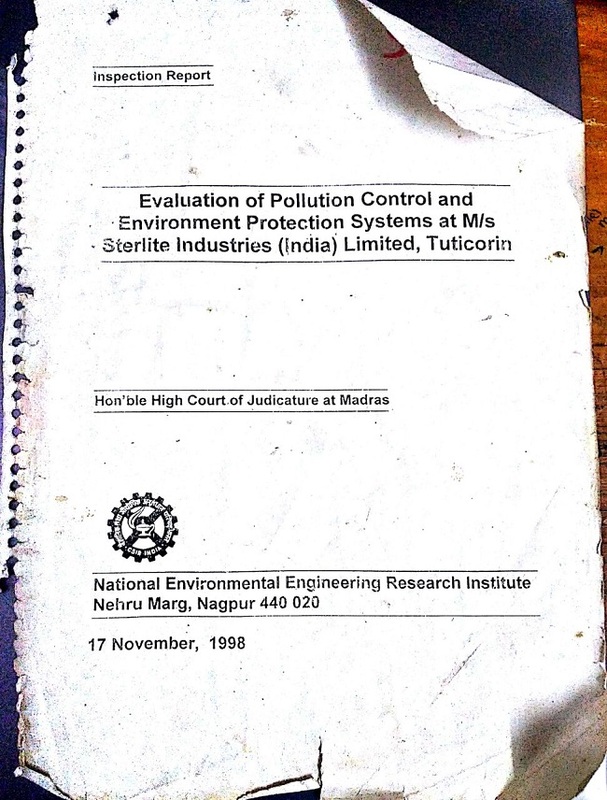 The 1998 report by National Environmental Engineering Research Institute (NEERI) was also its most damning. Referring to Sterlite’s effluent treatment plant (ETP) as inefficient, NEERI found that the ETP was unable to treat the effluent to the standards stipulated by the Tamil Nadu Pollution Control Board. NEERI reported that the levels of arsenic, selenium and lead in treated effluent were higher than prescribed standards. The NEERI inspection team found three dead birds in the surge pond when they visited there on 1 November, 1998, apparently due to the consumption of water contaminated with heavy metals. Sterlite tried to downplay the failure of its ETP saying the treated water was being “recycled” for cooling the hot slag that comes out as waste from the furnaces. However, NEERI dismissed these arguments observing that the process of cooling the slag by spraying leads to emissions of aerosols containing arsenic, selenium and lead, which can cause health hazards to workers and people living in the vicinity. At that time, Sterlite was producing 40,000 tonnes per annum, 10 times less than what it is producing today. Then between 1999 and 2007, NEERI received Rs 1.27 crore worth of contracts for various studies, all of which uniformly defended Sterlite’s operations and underplayed its impact. NEERI’s audit found problems. Treated effluent exceeded limits stipulated by TNPCB for Total Dissolved Solids and Sulphates. The test borewells around the secured landfill and gypsum dump inside the factory had high mineral contents, suggesting leakage from the facilities. Arsenic levels were above the stipulated drinking water standard of 0.05 mg/litre in some of the wells, and cadmium, chromium, copper and lead too were in excess of drinking water standards in some wells. Outside the factory, NEERI took 8 groundwater samples, 7 from handpumps and one from a dugwell. The samples from a handpump and dugwell from Kayaloorani, a village 2-km northwest of the factory were the most polluted – with cadmium at 2 to 5 times higher than safe levels, chromium 2 to 3 times higher, copper 5 to 9 times higher, lead 3 to 4 times higher and arsenic 4 times higher than permissible levels. Contaminants in the handpump water from Therku Veerapandiapuram exceeded permissible levels for chromium, copper, lead and zinc. 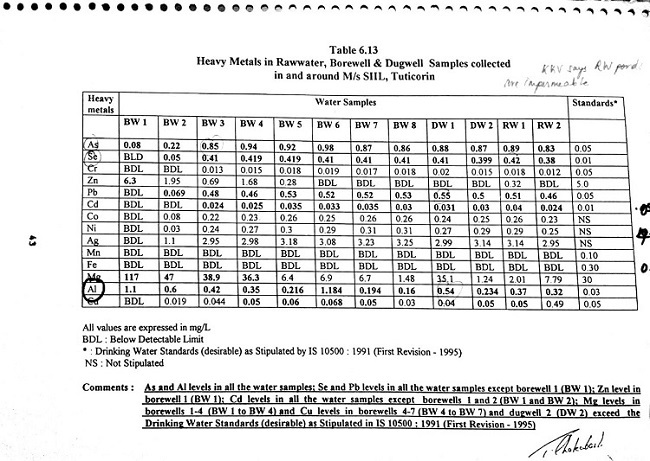 Copper and zinc in Meelavittan handpump water, and copper in Silverpuram handpump water exceeded permissible levels. 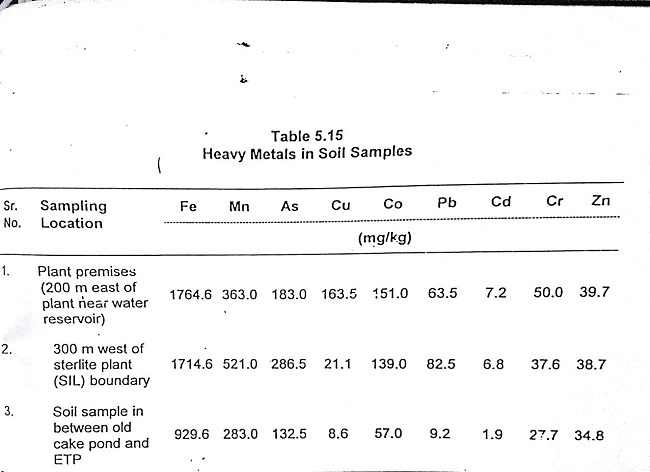 This was the only study that analysed soil samples for the presence of heavy metals. Arsenic levels in the three samples taken ranged from 132.5 milligram/kilogram to 286.5 mg/kg. The highest level was found in soil collected from 300 metres west of the Sterlite plant boundary, in the agricultural lands near Kumareddiapuram – the site of the ongoing protest. Soils containing more than 50 mg/kg of arsenic are to be treated as hazardous wastes under the Indian Hazardous Waste Rules, 2008. Community Environmental Monitoring, an NGO program advised by this author, undertook a sampling exercise in October 2010. 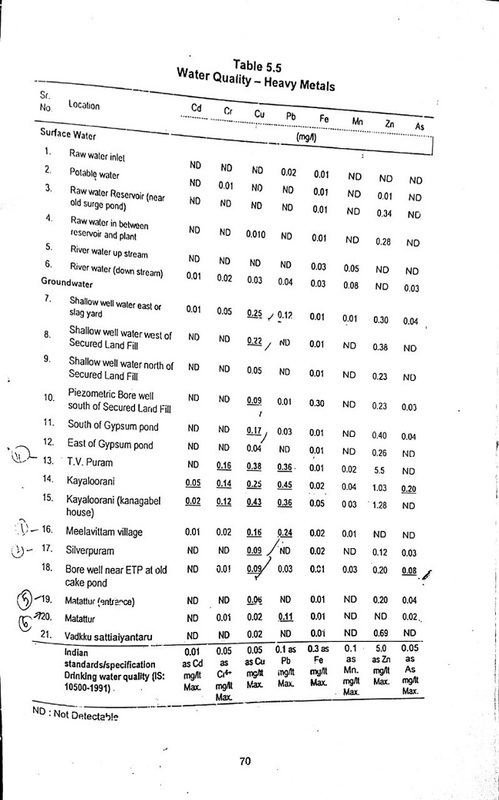 A water sample from an open well collected from a farm in Kumareddiapuram near Sterlite’s slag dump was found to be “completely unsuitable for use in irrigation” because of the high levels of salinity. According to the Food and Agriculture Organisation, salinity levels above 2000 mg/litre can cause severe damage to crops. The water in the open well had a salinity level of 7854 mg/litre – nearly four times the level at which severe crop damage can occur. Another sample of water from a handpump in Therku Veerapandiapuram contained sulphate levels nearly 10-times above levels that can cause serious stomach disorders, including severe aches. The well water and the handpump sample contained high levels of calcium – an integral component of gypsum, also known as Calcium Sulphate dihydrate. Sterlite generates and dumps large quantities of gypsum in the vicinity. A soil sample collected from the backyard of a residence in Therku Veerapandiapuram village contained 3,35,602 mg/kg of iron. At such levels, accidental ingestion of just 3.5 grams can cause serious poisoning in a child. Consuming larger quantities can be lethal. Symptoms of iron poisoning range from abdominal pain, vomiting, diarrhea and damage to the intestine. Other effects include heart, liver and central nervous system damage. The owner of the residence said the soil in the backyard was brought from near the Sterlite factory to raise the level of the land. There can be many sources of iron in the environment. However, Sterlite uses copper concentrate as raw material, and iron is present at roughly the same proportion as copper in the concentrate. Iron-bearing wastes are the likely to be the single largest solid waste category generated by weight. Arsenic levels at the same location were 532 mg/kg. Soils containing more than 50 mg/kg are to be treated as hazardous waste under Indian law. Inorganic arsenic is carcinogenic in humans, most commonly producing skin, bladder and lung cancers through inhalation and ingestion. Cadmium, which causes lung cancer and is toxic to kidney and bones, was ten times above average background levels in the backyard soil sample, while nickel, which causes skin allergies and bronchitis, was also found at elevated levels. Prompted by villager’s complaints that goats and cattle routinely fall sick, and sometimes die after consuming water from the canal running through Sterlite, a sediment sample was collected from the Kalangarai Odai (stream). The stream runs through Sterlite and drains the gypsum dump before entering Meelavittan. The sediment sample contained 28,643 mg/kg of iron – 477 times above levels that can cause serious health effects. Arsenic levels were nearly 8 times higher than levels considered safe by the New Jersey Department of Environment. Cadmium was 26.5 times above levels considered safe, and copper, lead, nickel and zinc were also elevated. According to Dr. Mark Chernaik, a toxicologist with E-LAW (Environmental Lawyers Alliance Worldwide) of which the author is a member, “It would only take a goat to ingest 73 grams of this sediment to develop serious clinical symptoms of iron poisoning.” Animal husbandry in Meelavittan, a village well-known for rearing goats and cows and cultivating fodder, is non-existent. Villagers say this is because cattle fall sick frequently and die prematurely due to pollution from Sterlite. NEERI took samples from 12 wells inside the factory. All 12 samples were contaminated, and had higher than permissible levels of dissolved solids. Nine samples violated the limits for sulphates and iron content, and five exceeded the permissible fluoride levels. This study found groundwater samples taken from outside the factory to also be contaminated. Four out of 7 samples exceed standards for sulphates, calcium and magnesium. All three samples taken from Therku Veerapandiapuram, the village closest to the factory had high levels of iron – between 0.712 mg/litre and 10.16 mg/litre. A May 2017 study of heavy metal pollution in SIPCOT Thoothukudi is quite revealing. Thoothukudi is a water-stressed district. Industrial activities have worsened the stress by contaminating water sources. Several studies identify the industries located within and around the SIPCOT Industrial Estate in Meelavittan area as the source of pollution. However, not only are no steps being taken to curb and reverse pollution, the Government of Tamil Nadu plans to intensify industrialisation in the district. Nityanand is a Chennai-based writer and social activist who has been associated with the campaign against Sterlite’s pollution for more than 15 years.